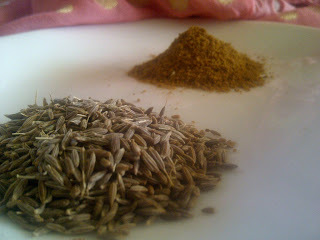 Cumin is the umamiest spice in the world, a rising star about to overtake pepper as our favorite seasoning. When toasted, cumin really comes alive: the seductive aromas signal satisfaction. Like all spices, cumin affects our perceptions of how good something tastes, how much we desire a food, and what we will do to get it. Of course so do expectations, attitudes, and ambiance. If we expect a sensual, deeply satisfying food experience, and the environment is supportive, our experience reflects exactly that. If our food is also umami, we experience savory satisfaction. 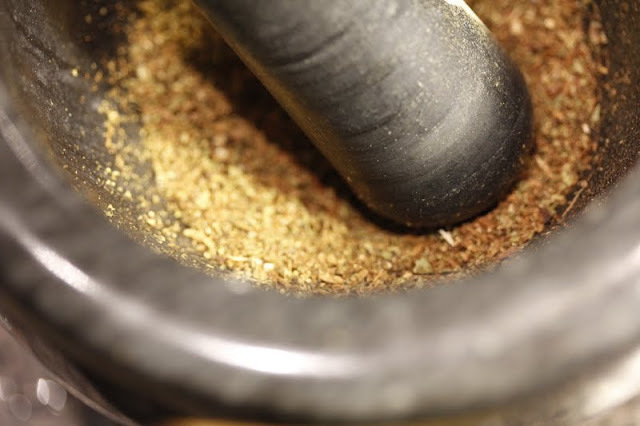 Pulverizing cumin seeds by hand in a mortar, say Tunisian olive wood, with a hard round wood pestle, makes the food feel deeply sensual. Toasting releases an earthy warm, nutty, brothy quality that can now be beautifully imparted to grilled, summer-ripened white peaches, opulent aubergines, or to a a garlic hummus topped with cilantro and paprika. Impossible to separate the blending of all the senses, and each taste—sweet, sour, salty, bitter, umami and fatty, acts as a signal guiding us towards selecting which foods and nutrients we need to survive and enjoy. The Rig Veda indicates that cumin was in common use in the region of India thousands of years ago and probably originated in that area. When you anticipate pleasure by pairing Indian food such as Baingan Bharta (Eggplant Curry with cumin) with an artfully Syrah and Grenache, you optimize the pleasure and value food and wine can provide. Some of the best cumin recipes evolved over thousands of years into present-day Indian curries, and no surprise, India is the largest producer of cumin in the world: 25 to 30 thousand tons annually. If we fully engage in creating a dish like the hummus pictured above, which is not only the oldest appetizer in the world but also possibly the most popular and one of the healthiest, we get multisensory-enhanced umami, way beyond taste: we get emergent flavor that is a fusion of everything. Every aspect of the process from toasting to dining will affect your final experience. Roast cumin seeds in cast iron pan for 5 minutes till lightly browned. Heat the skillet fairly hot; a then stir seeds with a wooden spoon until they begin to emit their fragrance and look lightly toasted. Cool then add to mortar with garlic and salt. Pound till more flavor is released from garlic and cumin. Grind pepper. Optional*: (basic recipe is still delicious but roasted red pepper increases overall umami and adds sensory notes of smokiness, charred, sweet and also bitter) Roast red peppers in 450 degree oven till browned on all sides. Peel skin. Pull our seeds and center and dice pepper flesh finely. Add to hummus at very end. Save a few strips for the garnish. 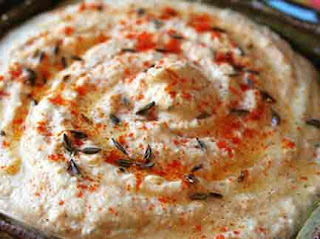 Put 1/2 the lemon juice, tahini, cayenne, sour cream and pepper into the blender and blend for 5 seconds. Add the chick peas and blend on high until it reaches a granular and more or less homogenous texture, about 10-15 seconds. Blend in remaining lemon juice to taste. This can also be done by hand which adds a few minutes. Put blended ingredients in attractive dish. Drizzle olive oil over the top. Sprinkle with paprika and make a swirl pattern on top. Garnish with cilantro and black olives. Serve with pita wedges, lightly toasted.